East Beach consists of a very fine shingle ridged beach with sand at the water’s edge. The beach extends as far as the eye can see along the Chesil Beach to Portland Bill. West Beach consists of a fine, smooth, pebbly beach, with shingle and sand at the water’s edge. It is ideal for younger children due to a protective cove being formed between the harbour’s Jurassic Pier and the Esplanade’s rock armour groynes. 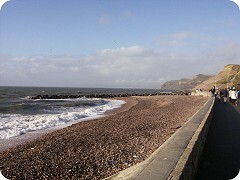 West Bay features in the Good Beach Guide as achieving the highest award for sea water quality. The Environment Agency sample water purity on West Beach only, as prevailing sea currents would drive any impurities in that direction. Therefore, although East Beach is not listed for water quality, it should achieve as good, or better results to that of West Beach. 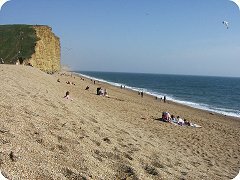 Although both beaches are cleaned regularly by West Dorset District Council, please dispose of your litter sociably. There is ample long stay parking, all to the east of the harbour. The West Bay Road Car Park, Station Yard Car Park and East Beach Car Park all have low 'all day' charges. Short stay parking to the east of the harbour are the Bridport Arms Car Park, the Quayside Car Park by Harbour Cafe and outside The George. To the west are The Esplanade Car Park and The Mound Car Park. Motorhome vehicles are only permitted to use the Station Yard Car Park. There are also some disabled parking spaces at the West Bay Road, Quayside and Esplanade car parks. West Bay Road - Locked overnight from 10:00pm to 8:00am. Station Yard - No overnight parking permitted from 10:00pm to 8:00am. Public toilets are available behind the shingle ridge of east beach, at the main car park to the left of the mini roundabout when entering the town and also at the south-western corner of the inner harbour, behind the Harbour Master's office on the Mound. Baby changing facilities are provided. There are also disabled toilets, accessed by a radar key. If you don’t have a key, registered disabled can apply for their own key through their local health authority. Dogs are not permitted on East Beach and West Beach during the summer months between 1st May and 30th September. They are permitted during the winter months between 1st October and 30th April. Dogs are permitted on the East Cliff Beach area and West Cliff Beach at all times, whereby access is by the path alongside East Cliff or down steps from the Promenade to West Cliff Beach. On the permitted beaches, dogs can be off the lead but must be kept under reasonable control and not become a nuisance to other beach users. The whole of West Bay also operates a clean zone regularly patrolled by wardens, whereby dogs must be kept on a lead not exceeding 2 metres (6ft 6ins). Dog owners who do not clean up their dog's faeces, including the beaches, will incur an on the spot fine of £100 and can face further fines of up to £1,000. Bins are provided. Not having suitable equipment to clear up faeces will not be accepted as an excuse. It is an offence to feed seagulls in a public place at West Bay. Seagulls have recently become more aggressive due to humans deliberately offering or leaving food (mainly chips) for them. The snatching of food, ice cream, etc. is often reported, especially being taken from unsuspecting children. It is permissible to launch small non-motorised craft from the beaches. These include kayaks, canoes, rowing and sailing dinghies that can be easily manhandled across the beach without a trailer. All motorised craft, including jet skis, should not be launched from the beaches. An RNLI Lifeguard Beach Patrol Service operates during the school summer holiday season at West Bay. An HM Coastguard Auxiliary Rescue Service also operates from West Bay. In an emergency situation, dial 999 and ask for the Coastguard. 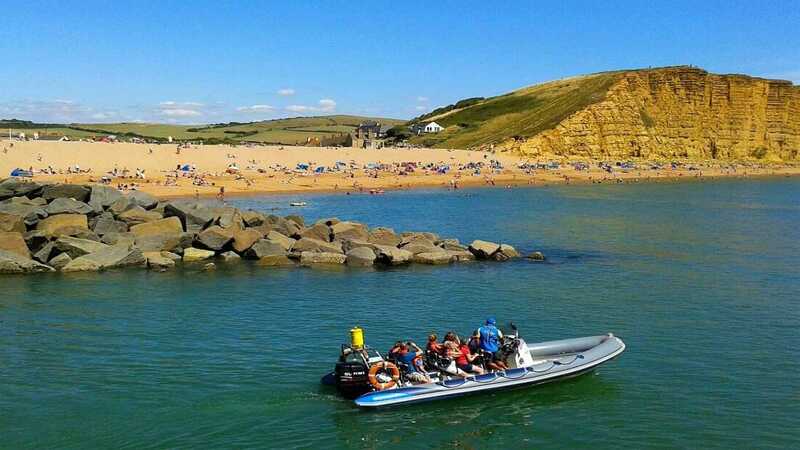 We want you to enjoy the sea at West Bay, but please observe safety procedures. Take note of all safety signs on the beaches. Do not enter the sea during adverse weather conditions and never when the sea looks rough, even during the summer!